So I guess you're probably wondering why I'm making a page based on yet another harem anime. Nothing new here right? A guy ends up running a girls dorm, stuff happens, etc etc... But as I read the manga I actually found I enjoyed it a LOT. Enough to make it my favorite manga series. And the anime... is passable I guess. 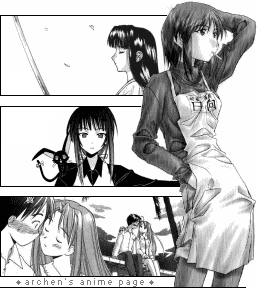 But hey, if I'm going to make a page, it might as well be on something I really enjoy, and the Love Hina manga is most certainly that. This page was intended to be a character index, but added a few more things just because. Keep a few things in mind: Character ages may not be accurate, as Love Hina takes place over the course of years. Names are given in [given name] [family name] format - i.e. western style. This page may contain spoilers. I tend to go out of my way to avoid the spoilers (it's a lot more fun if you find out for yourself when you read it), but it's quite possible that I'll give something away: so read at your own risk.